This month's quote comes from late speculative juggernaut C.S. Lewis, who is perhaps best known for his highly regarded fantasy series, The Chronicles of Narnia. I must admit I was never a huge fan of the Narnia books growing up, though I did enjoy The Space Trilogy as a kid. I can't tell you how many times I've seen (insecure) writers asking their peers to critique the originality of their grand ideas in the various online writing communities I lurk. Hell, we've probably all had those thoughts from time to time. Has this been done before? Worse yet, is this overdone? We'd all like to think our Exciting New Thing exists only within the bowels of our minds until we wrench it out and get it written, but considering how long people have been telling stories, I think we just have to face the facts: damn near everything has been done already, probably more than once. There have been books and books written about the fact that most of us are just telling the same stories over and over again. But that's okay. Every artist worth a hill o' beans in this world is influenced by the things around them and the experiences they've accumulated, including the books they read, the movies they watch, and the stories they were told when they were tucked into bed at night. That influence is not a bad thing. More importantly, finding true originality is not just about a story's premise or character archetypes. As Mr. Lewis puts it, it's about telling the truth. What on Earth does that mean? I can only tell you what it means for me. For me, it means pouring as much of myself onto that page as I can muster. It's about finding my own personal truths (some of which might take a lifetime to find) and putting them to work. Every time I sit down to write, I aim to chisel off a little chunk of my soul, grind it down with a mortar and pestle, and sprinkle the remnants all over my fiction. Because no matter how often the world may have been told the same old stories time and time again, I can guarantee they've never met a creature like me before. And they've never met you, either. So the next time you find yourself worrying over the originality of that story you've been tinkering around with, switch gears. Focus on yourself and your relationship with the story you're telling. Put a little you in it. If you're honest about it, chances are you'll find something original, even if by accident. I see some of this in my work as a ghost writer. People think that they have an incredible idea, but honestly, it's so many other things that make a work unique. Absolutely! Ideas are a dime a dozen. It's perspective that counts. Thanks for stopping by, Stu! The best thing a writer can ever hope to achieve is to capture a glimpse of what it means to be human and reveal it in his fiction in an effective way, whatever form that takes. Every person is unique, including every writer, and it's in the way in which that uniqueness illuminates that shard of human truth that originality resides. I don't worry about originality. I know what I write draws upon so many other things. I just try to make it my own. You've got the right approach, Alex! You can chase your tail all day trying to be original and never catch it. Alden----new follower here... came by to say thanks for your kind and thoughtful comment on my blog and I'm so glad I found my way here! I can tell you're a talent even the way you described things in this post... "We'd all like to think our Exciting New Thing exists only within the bowels of our minds until we wrench it out and get it written" <---Loved that! Thanks so much, Morgan! I really appreciate it. And no problem. 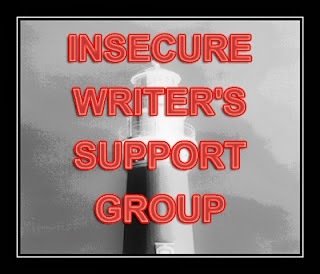 Always glad to connect with fellow (insecure) writers! Thanks, Rebecca! You're absolutely right, we're all unique. Reaching into that uniqueness and pulling something back out is easier said than done, but it's better than beating yourself up trying to find something "original" in this day and age when everything's been done. This is an excellent point and great advice. I love the CS Lewis quote. We must be true to ourselves before we can be true to our readers. Thanks so much for stopping by and welcoming me today. Much appreciated! No problem, Heather! Nice to meet and connect. Thanks for stopping by! Great post! I don't worry too much about originality anymore in my writing because, when it concerns ideas and themes, they've all been done before. And, that's okay because readers aren't looking for new ideas and themes, so much as they're looking for unique perspectives on the old ones. Originality has to come from the details which need to come from the author. The author can be unique in so many little ways that it makes the story completely different from every other story ever told, so long as enough of themselves is in it. Sounds like we're on the same page, Cathy. I agree wholeheartedly. It's all about what the author brings to the table, now how many "new" elements can be crammed into a story. In other words, voice, everyone has their own, some are more developed than others. Good explanation. Thanks, Nancy! Appreciate the comment. I like it: Truth. I'll just tell my story as truthfully as I know it and it will be my originality. I can buy that. I've accepted that every idea has probably been done before. That said, I also believe it's possible to give a new twist to make an old idea new and exciting. Therefore, I don't worry about originality. I just try to find a fresh way to tell something. That's pretty much the gist of it, Patricia. It's the bits and pieces of ourselves that we put into the stories that make those old ideas new and exciting. Fantastic post and fantastic quote. C.S. Lewis sure said some great things. He really was brilliant! He did, indeed. Despite the controversy that floats around his themes, C.S. Lewis was a great writer, and there's much to be learned from his work and his words. Thanks for stopping by, Jennee! Very, very good point. It is real hard to be original now with how many ideas have been done already. But it can be done! People should be inspired by others but not be so consumed about something sounding similar. As long as it is 100% yours, it will be original. Wonderful post and great words of wisdom! Exactly, Paige! You hit the nail right on the head. We're all different, and we can all tackle similar subjects from different angles and learn from the differences. I've heard people say that every old story told in a new voice is a new story. I don't worry about being unique; I'm a pretty unique person (okay, weird is also an apt descriptor), so I just focus on trying to like what I write, and to develop the people in it as well as possible. Because really, there isn't an idea that's completely new; what's new is how I write it: the characters, the setting, and the interaction. Different, well-written characters in the same plot make an entirely different book. And I don't know about anyone else, but if the characters grab me, I'll read the story. That is a fantastic piece of advice! I think everyone worries about originality from time to time, but it is the writer who makes a piece of work unique. Exactly, Kyra! It's not a bad thing to want to be original, but it's a rabbit hole that can be as deep as you dig it if you're worrying about the wrong things. Thanks for the comment! The greatest works of fiction aren't original. They're universal. That's what makes them great J.W. That's definitely a great way of putting it, Maurice. Thanks for stopping by! So very true. Dino Buzzatti would have been nothing without Dante. And the Greeks likely spun every story out there. Just replace Prometheus Bound with -some random contemporary- and you have the next best hit that's been done before. The important part here is to spin the concept "you've come up with" in a new and personalized direction. So what if part of what you've done has been done before? The rest of it hasn't! Well put, Randi! You hit the nail right on the head. There's no shame in inspiration, intentional or otherwise, but it's all about building on those foundations with bits of ourselves.